The Charm Bracelet History. 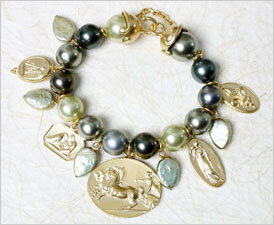 Victorian Cameo & Intaglio Charms, Bracelets and Necklaces. Should we start at the beginning? Wed have to go all the way back to the Stone Age to track down that first charm, made from an animal bone, or shell, and worn on a thong to protect the wearer from Saber Tooth Tigers, or evil spirits, or just plain bad luck. So lets skip ahead a few thousand years. Well pause briefly with the Babylonians, who receive the honor of being the first recorded culture to wear charms on bracelets, in around 700 BC. But now lets fast forward all the way to the mid 1800s, because, until then, charms, amulets, actually any piece of jewelry was always made by hand, one at a time. If Fashion is a glove, then the Industrial Revolution is the hand it fits over. The machine age afforded the growing middle classes the opportunity to own and wear articles of beauty that had, heretofore, been out of reach, financially. 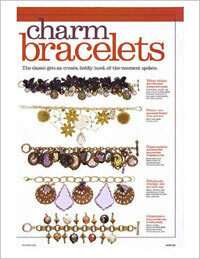 And when it comes to the Charm Bracelet, no single person drove that popularity like Queen Victoria (reigning 1837-1901). She loved Fashion, and she loved to wear and give charm bracelets. When her beloved Prince Albert died, she even made mourning charms popular; lockets of hair from the deceased, miniature portraits of the deceased, charm bracelets carved in jet. In 1889, Tiffany & Co launched their first charm bracelet at the Paris Exposition--a chain link bracelet with a single dangling heart pendant. It was a hit. The Charm Bracelet was officially here to stay. The 1920s and 30s brought another wave of charm innovation, as the allure of platinum and diamonds brought a new level of elegance to the charm keepsake. In the World War II era, there was a resurgence of popularity for the charm bracelet, when soldiers brought home charms as souvenirs from the European cities they had been stationed in. This trend continued well into the 1950s, fueled by images of Elizabeth Taylor or Joan Crawford on the silver screen, impeccably dressed, and accessorized with a beautiful charm bracelet. Women of all ages wanted charm bracelets to add to, throughout the years, as they traveled, or marked important events in their lives, or the lives of their children. Collectables soared in popularity in the 1990s with the general economic boom. Vintage everything else, including vintage jewelry, charms and charm bracelets that harkened back to Old World craftsmanship became more popular. Over the past decade most of the Fashion giants have climbed on board, when it comes to offering their own interpretation of this timeless classic. Extasias Charm Du Jour, first launched in 2000, offers everything we all love in a charm bracelet--its loaded with charms, all distinctly beautiful in their design, craftsmanship and colors. 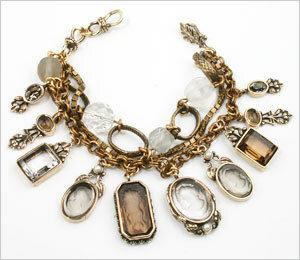 An instant heirloom, as it were, linking together 3,000 years of history with the hottest trend in contemporary fashion. 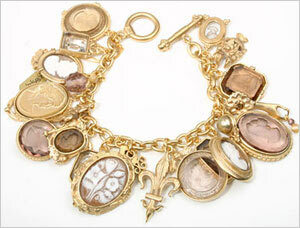 Extasia is a company of American artisians, committed to re-inventing Victorian Jewelry for Contemporary Fashion. We use hand-carved Italian shell cameos, hand-pressed German glass intaglios, jet, vintage glass, and semi-precious gem materials, combined with the gold plated, bronze and sterling silver settings we design and manufacture, here in northern California.